Meet World War Z Author Max Brooks!! Meet World War Z Author Max Brooks Tuesday, April 1st from 2-4PM Join us as Max Brooks stops in to discuss and sign copies of his newest graphic novel "The Harlem Hellfighters". The Harlem Hellfighters From bestselling author Max Brooks, the riveting story of the highly decorated, barrier-breaking, historic black regiment—The Harlem Hellfighters The Harlem Hellfighters is a fictionalized account of the 369th Infantry Regiment—the first African American regiment mustered to fight in World War I. From the enlistment lines in Harlem to the training camp at Spartanburg, South Carolina, to the trenches in France, bestselling author Max Brooks tells the thrilling story of the heroic journey that these soldiers undertook for a chance to fight for America. Based on true events and featuring artwork from acclaimed illustrator Caanan White, these pages deliver an action-packed and powerful story of courage, honor, and heart. Max Brooks The New York Times bestselling author of The Zombie Survival Guide and World War Z, Max Brooks has been called “the Studs Terkel of zombie journalism”. His new comic book series, "The Extinction Parade" is available in print from Avatar Comics and can be downloaded from Comixology.com. His upcoming graphic novel "The Harlem Hellfighters" will debut in April of 2014 from Broadway Books. For more information about Max Brooks please visit: http://maxbrooks.com/ " All our in-store events are free and open to the public. There is parking available in the lot behind the store and in the surrounding neighborhood.Click here for parking information http://www.doylestownborough.net/visitors/parking. If you can't come to an event and still want an autographed copy of the book, you may purchase titles in advance either in the store, over the phone (215.230.7610), or through our website. Join Bosco and Alex the third Sunday of each month at 2PM as they discuss Post Apocalyptic Fiction.This limited run book club will cover all your favorites, eco-disasters, nuclear holocaust, zombie apocalypse and vampire plagues among other grand end of the world scenarios. Which book will reign supreme? Join them each month and help them decide. This month's book is World War Z by Max Brooks. Max Brooks, World War Z. Event location: 126 N. 14th St.
Max Brooks is currently considered a "single author." If one or more works are by a distinct, homonymous authors, go ahead and split the author. 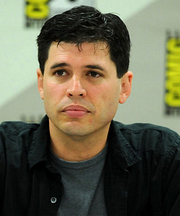 Max Brooks is composed of 3 names. You can examine and separate out names.